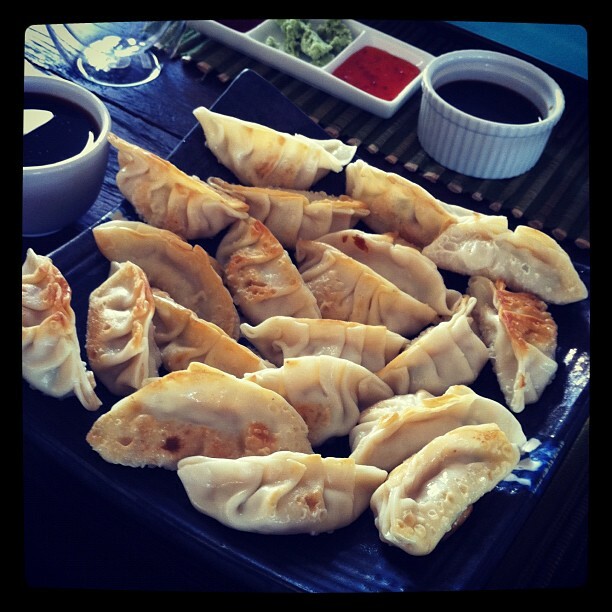 It's said that gyoza originated in China and was introduced to Japan. Gyoza wrappers are slightly thicker than wonton wrappers. Gyoza is cooked in various ways, such as steamed, pan-fried, and so on. Also, there are a number of variations in the filling. Different kinds of vegetables and meat can be used for the filling. This is a recipe to make the most common pan-fried gyoza. Combine all ingredients and seasonings for filling in a bowl and mix well by hands. Place a spoonful of the filling in a gyoza wrapper and put water along the edge of the wrapper by fingers. Make a semicircle, gathering the front side of the wrapper and sealing the top. Heat about 1 Tbsp of oil in a frying pan. Put gyoza in the pan and fry on high heat until the bottoms become brown. Turn down the heat to low. Add about 1/4 cup of water in the pan. Cover the pan and steam the gyoza on low heat until the water is gone and cooked through. Serve gyoza with dipping sauce on the side.